Industrial Rope Access Trade Association (IRATA) is recognised as the world’s leading authority on industrial rope access. It has over 450 member companies around the world and has trained in excess of 140,000 rope access technicians worldwide. IRATA directs and regulates, through its members, the training of all workers seeking its qualifications. These member companies provide training, operational services, or both. A proven solution developed by IRATA that is recognised internationally by multinational corporations for reaching inaccessible places safely at locations such as offshore platforms and installations, buildings and industrial plants. Industrial rope access system is a safe method of working at heights, where ropes and equipment are used to suspend or support the user to access and egress in the workplace. The benefit of using rope access methods lies mainly in the safety and speed with which workers can get to or from difficult locations and then carry out their work, often with minimal impact on other operations. 5 days duration for all level certification followed by a day of Assessment by an approved independent Assessor by IRATA. Equipment will be provided throughout the course and assessment. Under the IRATA certification scheme, all rope access work must be supervised by an IRATA Level 3 supervisor, qualified in First Aid. 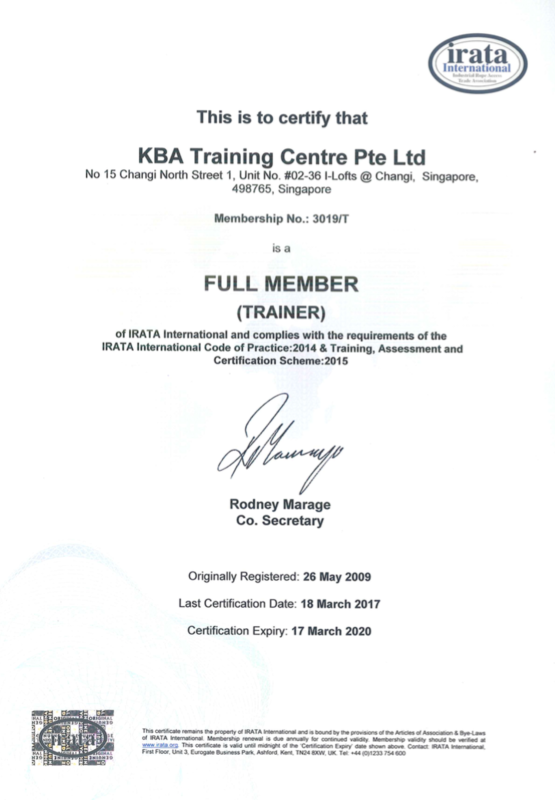 KBA Training Centre Pte Ltd - Industrial Rope Access Training Manual is a definitive industrial rope access manual and an essential reference for practitioners of all levels. It is in A5-size booklet and is complimentary to all course candidates who've enroled for the rope access training. See IRATA TACS (Training, Assessment and Certification Scheme) for the detailed syllabus, requirements for levels 1, 2 and 3 rope access technicians, and principal contraindications to working at a height and other relevant information. *Any level rope access technician undertaking re-assessment after the expiry of the current assessment would require a minimum of four days of training instead of the two days. Holders of expired level 2 or 3 certificates or others with questions should contact an IRATA training company for information on revalidation procedure. To ensure technicians are up to date with certification, re-assessment may be done up to 6 months before due expiry date without any time penalty. Each IRATA member company should ensure employees hold valid assessments.